IgnitionWeb | 3rd Party and Legacy System Integration | ERP, CRM, etc. Our skilled team of developers, technical architects, and database administrators work together with you throughout the planning and production process to ensure that all interfacing with your existing technologies and systems is deployed smoothly and with optimum performance. Using IgnitionWebs standardized advanced-development tools and techniques, our development team is able to deliver the customized solutions usually only available in high-end applications, but for a fraction of the development time and cost. By working with our clients from the very beginning to thoroughly understand their e-business requirements, we can recommend the best technology strategy to help achieve those goals - quickly, efficiently, and cost-effectively. Display your products and services catalogue and take orders online. 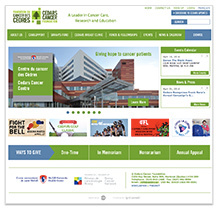 Cedars is a non-profit organization aiming to improve the lives of cancer sufferers and their loved ones through their diverse research, patient care, and cancer education programs.